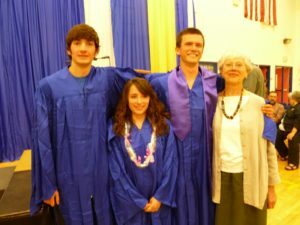 Each year the Orcas Island Chamber Music Festival honors graduating seniors who have demonstrated that music plays an important part of their lives. The Marilyn Anderson Young Musician’s Award, funded through the Thyra and Bud Anderson Advised Fund, was presented at the “Celebration of Success” ceremony at Orcas High School on June 15th. Students Mackie Blackburn, Robin Gropp and Susanne Meitzner each received a $500 award, presented by OICMF Board Member Catherine Pederson and Executive Director Victoria Parker. The Chamber Music Festival is committed to supporting music education, and thrilled to have watched these young people grow into talented and dedicated musicians. 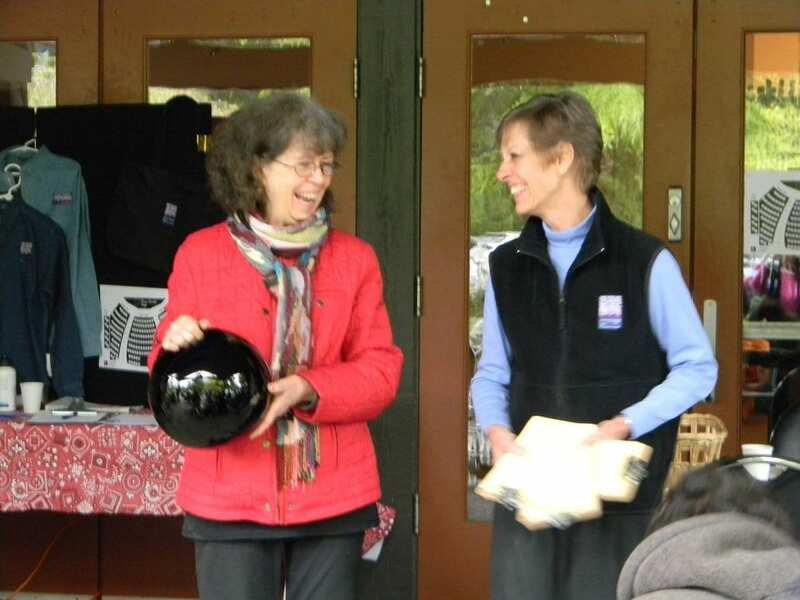 Violinist Monique Mead and pianist Deborah Rambo Sinn created a collegial partnership to team-teach music students and community ensembles on Orcas Island. The week of May 15-19 was awe-inspiring! Generously sponsored by an OICMF donor family. 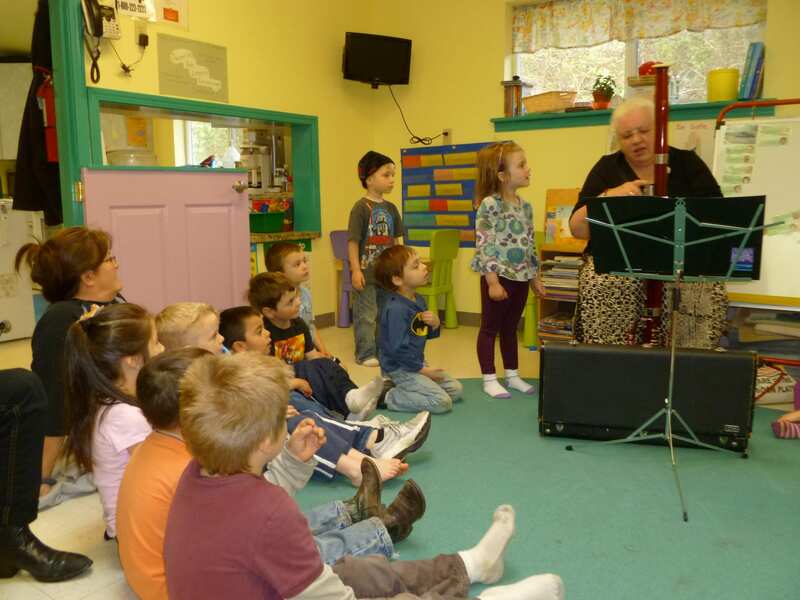 Orcas Island Chamber Music Festival’s Pied Piper and bassoonist Judy Whiting visits Kaleidoscope preschool, amazing young ones with the high and lows of her very big woodwind. Learning the language of music with Judy and her bassoon kept the preschoolers’ rapt attention as rhythms, scales, short folk songs, and sounds like the ferry’s fog horn, a train, a dancing bear, and a clown sparked imaginations. The Pied Pipers are comprised of community musicians who volunteer their time for 20-30 minutes visits to the island’s four preschool centers. The program organized by OICMF and sponsored by a generous OICMF donor. 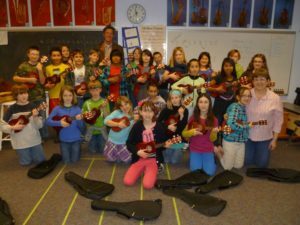 Thirty 4th graders at the Orcas Island Public School received ukuleles through Orcas Island Chamber Music Festival’s Musician-in-Residence program. 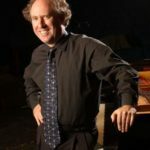 Gordon Koenig, as OICMF’s Musician-in-Residence, will work closely with classroom instructor Pamela Wright to augment the school’s General Music curriculum. “It’s so totally beautiful!” exclaimed Joey. “I’m naming mine Lucy “ piped another! The first day’s lesson include history of the ukulele, instrument parts and names, proper handling, and the F and C chords with the admonition to practice to be ready for Skip To My Lou next week! Funded through a gift by a generous OICMF donor. It’s our first Barn Dance for preschoolers and their families! Rachel Buchman and local talent will lead a fun afternoon filled with music, dancing and goodies at an historic Orcas Island barn. Teachers will be providing details to parents, or call the OICMF office for information: 360-376-6636. Salon Concert with Jon Kimura Parker – Extra Performance Added! 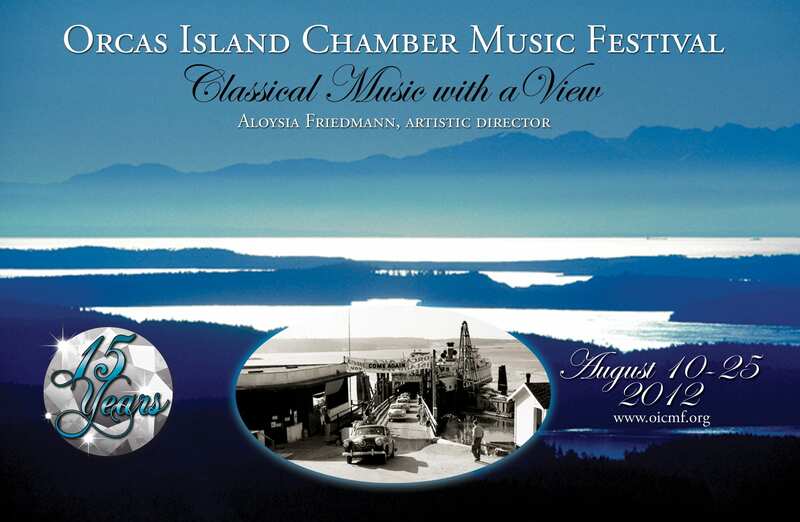 Orcas Island Chamber Music Festival’s Salon Concert on Thursday, Dec. 29th sold out quickly. 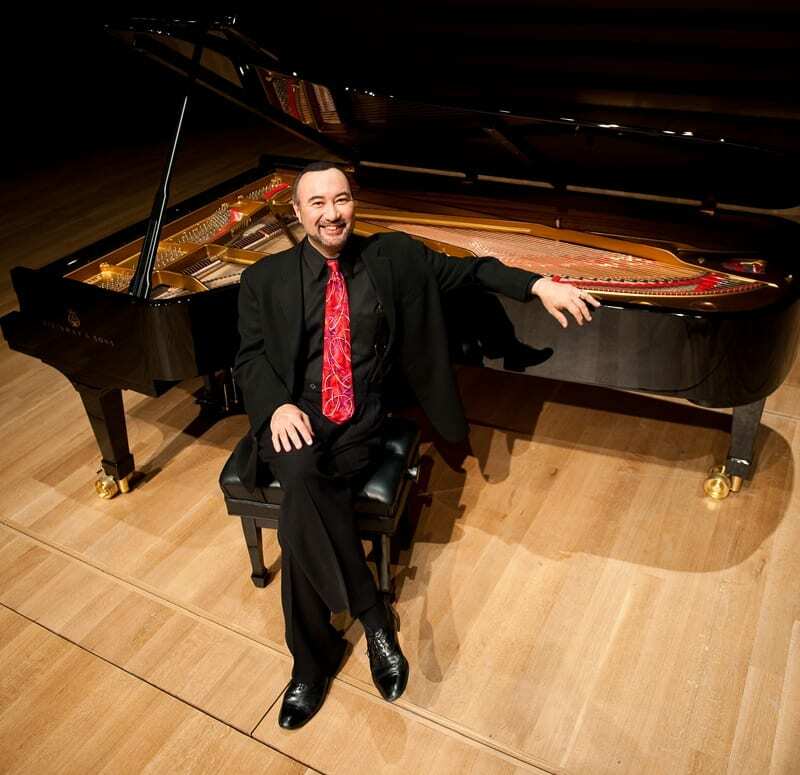 Now, pianist Jon Kimura Parker has generously agreed to perform a second concert so that others may attend. The concert will take place Friday, Dec. 30th, at 7:00 pm at Orcas Center’s OffCenter Stage. It promises to be a wonderful holiday evening to share with family and friends. Jackie will perform the same concert December 29th and December 30th. The program features Pictures at an Exhibition, Modest Mussorgsky’s most famous piano composition. 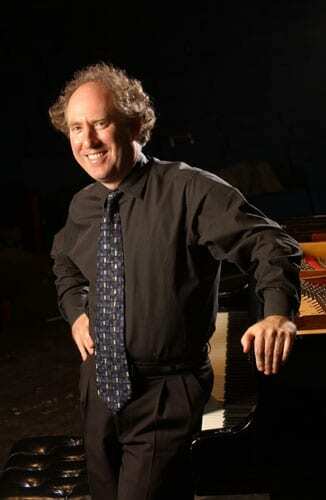 Jackie will also perform Sergei Prokofiev’s Piano Sonata No. 3 From Old Notebooks. Pictures at an Exhibition is an epic and hugely popular work with a fascinating history. Mussorgsky was a member of “The Five,” a 19th-century group of Russian composers. He was devastated by the sudden death of architect and artist Viktor Hartmann, one of his closest companions. An exhibition was organized in honor of Hartmann, using his sketches of architecture, characters and scenes from everyday life. This exhibit inspired Mussorgsky to compose Pictures at an Exhibition in six weeks, as he imagines himself walking down the hallway that showcased his friend’s work. The original piano version is rarely heard, but you can hear it performed by one of the world’s great pianists, Jon Kimura Parker, December 29th and 30th. Following the concert, guests will enjoy a nightcap reception, with Thurston Wolfe Festival wines and festive hors d’oeuvres. Tickets are available now. Call the OICMF office 360-376-6636. Tickets are $75. 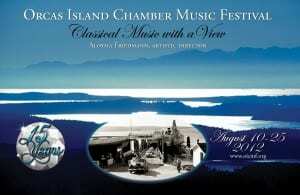 Proceeds benefit Orcas Island Chamber Music Festival programming and music education.